Every landscaping project in New Jersey has the potential to reflect a personal taste and style. Combining a designer’s eye, an architect’s detail and nature’s pallet, every patch of grass and pile of dirt can be made into something extraordinary. Joe Monello had this vision 28 years ago when he established Monello Landscape Industries, LLC. For nearly three decades, Monello Landscapes has continued to uphold the values of innovative artistry and attention to detail that clients have come to expect. For over 25 YEARS Monello Landscape Industries specializes in RESIDENTIAL and COMMERCIAL LANDSCAPING in NEW JERSEY of all shapes and sizes. From retaining walls, to outdoor kitchens, fire pits, snow and ice management, commercial site work etc.The foundations of Monello Landscapes Industries, LLC lie on the experience of its staff. The team is headed by Joe Monello, who holds a Bachelor of Science from Rutgers University in Environmental Planning and Design, and is made up of employees that stay on top of the latest developments in the landscaping field.At Monello Landscapes, we strive to let our crafted works speak for themselves. Each home is treated as if it were our own, giving our valued client the guarantee of our full commitment to their project. We have outstanding referrals and testimonials that are available on request and we are proud to be a Better Business Bureau Accredited company.Please feel free to contact us today for quotes, information or to provide feedback of our services. 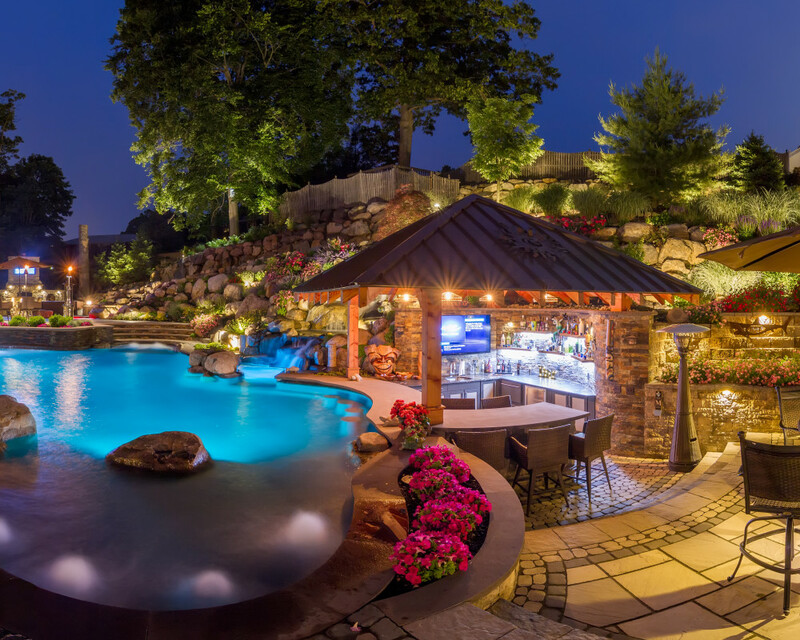 Built into a sloped backyard includes a swim up bar, multiple tiered patios, wall block, water features, fire features, and much more.